Adhesive tapes are simple pressure sensitive tapes which stick when pressure is applied to it. Adhesive tape was invented by Dr. Horace Day in 1845 for a procedure he invented by applying glue to a strip of a cloth. ​An adhesive tape consists of a backing material like paper, plastic or cloth over which lies the adhesive which forms the sticky part of a tape. 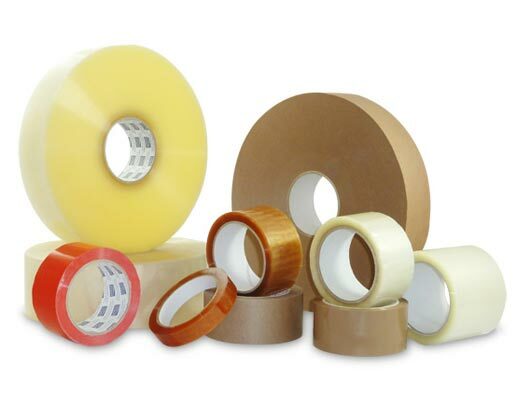 There are many types of manufactured adhesive tapes like duct tape, gaffer tape, masking tape, electrical tape etc. each of which serves a specific purpose. Not all tapes use the same raw materials or the same adhesive, but the manufacturing procedure is the same. The main raw material which is needed for the manufacturing of adhesive tape is the backing material which could be a cloth, plastic, or even paper. These backing materials can quickly become heavy and thick when wound around its cardboard roll. So to overcome this dilemma, a clever solution was determined. The solution was to use very thin backing material other than paper as paper is a material that when drenched in water becomes useless and increases the heaviness of the tape. Adhesive waterproof materials that were less heavy than paper were required. Eventually a thin synthetic transparent cellulose acetate film was discovered and used as a backing material. This material is an organic product obtained from the natural cellulose from the plants like cotton and hemp etc. Now that an ultra-thin waterproof backing material had been created, the next issue was creating the right adhesive. Lavish usage of glue would eventually add to the weight as the roller winds the adhesive tape around. The first decision was to use glue with less density. The amount of the glue to be applied was mathematically determined to maintain the perfect weight after it is manufactured. After many experiments, a synthetic rubber resin was created and this became an ideal glue for adhesive tape. The synthetic resin cannot hold the synthetic transparent cellulose acetate film. When manufacturing tape a primer is sprayed all over one side of the tape. This is performed by machines containing the rollers. After considerable amount of primer is sprayed, creating a thin layer, a layer of synthetic rubber resin is sprayed over the primer. The synthetic rubber resin holds on tight on to the primer and also to the synthetic transparent cellulose acetate backing film. Synthetic rubber resin has more water content and would drench the entire film and make it useless. To overcome this problem, the acetate film with the rubber resin and the primer is sent to a dryer inside the humidity chamber. The water content in the resin evaporates allowing the pure concentrated synthetic resin to lie on the acetate film. Usually, the temperature the dryers need to be to evaporate the water would be depending on the type of the adhesive used. The dried sheet of film is passed through a big roller and then to the spool which winds the tape over it. When the number of windings comes to a limit they are cut into small segments which are then quality assured for commercial distribution.